This post is intended as a starting point for online collaboration — let it be a launchpad for something you make yourself. I suggested the theme of ‘renewal’ with very little thought. The concept came very instinctively from the time of year we are in, the recent changing political landscape and some semi-dormant pagan leanings. Already fresh shoots are pushing up through the frozen winter soil ready to be bluebells and snowdrops. So, where am I with my renewal? At the turn of the year someone asked the typical question of what new year resolutions we were making. Honestly I had not put any thought into it, but said I wanted to “get more active politically”, or something like that. I’ve been on marches, always voted, but apart from that it’s been minimal engagement, a bit of clicktivisim here and there. I decided to start local and went along to my ward’s newly established local branch meeting. And then a constituency branch meeting. Suddenly I had a new group of people to relate to and a headful of power relationships and agendas. A week later I was helping man a stall in the high street to campaign for a better funded healthcare system. There are many more areas of my life that could do with some renewal, and you can probably find some of your own. It doesn’t have to a major effort, maybe be a simple act to relate with a friend again. 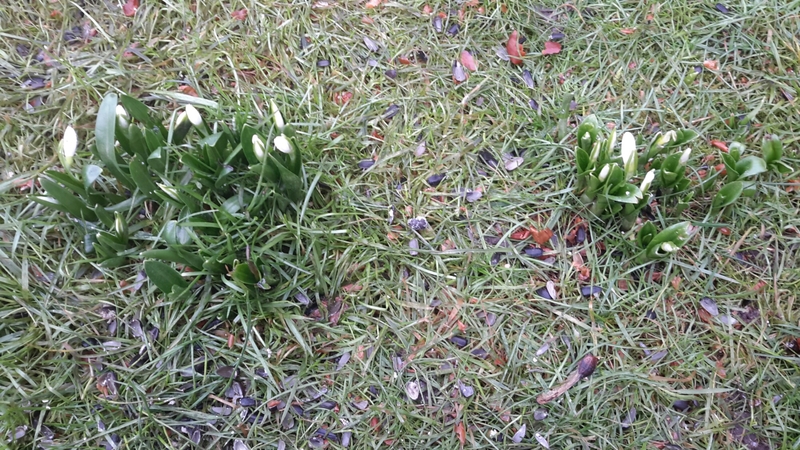 Let’s use the vigour of the coming spring to help recommit to action again. Move from passive to active – that’s the transformative power of renewal for me. I am doing one fundraiser this year, this time for Breast Cancer Care www.breastcancercare.org.uk. 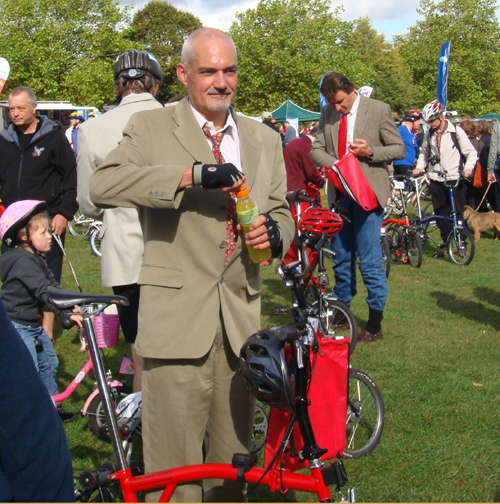 It means I have to cycle fast around a route on a very small bike, with some hills, in a suit; and do it twice. It’s next Sunday (21 Aug) and I just got signed up. Flip Cams get everywhere! On the other side of the lens for a change. 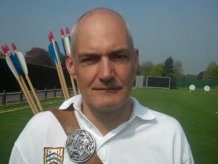 One of the nicest open shoots of the year I know is held next door to Kew Gardens by Royal Richmond Archery Club. It happened last weekend and, although I shot a below par round and didn’t near the medals, it was a great day out. Various participants (including me) were filmed on flip cams by some roving reporters – it was a bit spur of the moment and made me realise how ‘being on the spot’ and still being able talk coherently was quite a skill. I now appreciate even more the feelings of some of my past internal work video ‘victims’ – who still delivered some great snippets. If you shoot flipcam interviews – you should try and spend time on the other side as well! Learn more about my day at Winkball’s report (my bit has the same photo as the link). ‘Robin Hood’ing a longbow arrow? On Saturday we were shooting at 50yds when one I saw one of my arrows hit, but also something flew past the target? It makes me think that it would be very hard to actually get one arrow to stick into another with modern plastic nocks. Since taking up Longbow archery a few years ago I have been fascinated by the variety of bows available. Choosing one above another is difficult. It is not easy to try them out; friends at clubs may be OK with you having a go with their bow for a few ends, but it takes time to get to know what is working for you. So, I started out with a bow made by club resident guild member, Paul Reed, who had made bows for many members and others. I acquired a triple laminate bow (42 pound pull at 28 inches). This served me very well, even taking the Surrey Longbow championship one year, and still continues to be a reliable companion. Next, on a trip to Washington State, I came across Curt Brisky who fulfilled my next desire with a truly traditional lovely and sinuous pure Yew bow (50 pounds pull). This was a new experience and a new love. Faster and light in the hand 80 and 100 yards became more realistic distances to shoot, albeit with new arrows (arrows are a story for another day! ), and a bit of adjustment. Then I read a review of a Adrian Hayes bow on the Archers Review blog. I was impressed, even excited by what I read. If a bow was really that good I had to take notice. Yes I know it is only one part of the equation in the bow/arrows/archer mix, but I was struggling to find form with my current mix of arrows and bows and I was ready to take a chance. I phoned Adie and had a good chat; a few weeks later my new bamboo backed bow (52 pounds @ 28″) arrived. First impressions were good. Very good. The extra pounds felt OK, the bow was responsive and light in the hand. 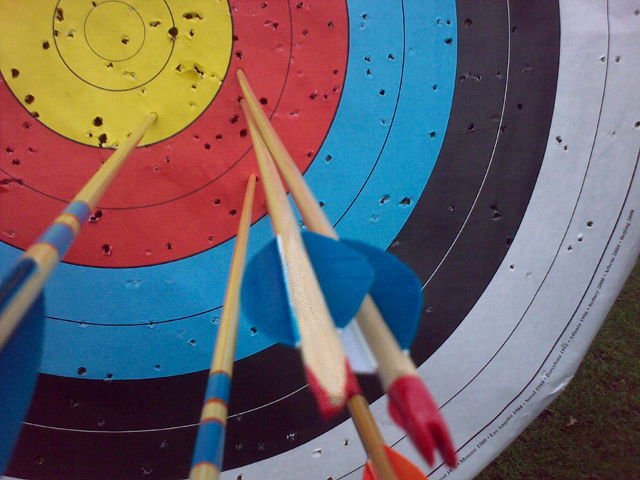 Arrows shot true and suddenly I started to realise where my weaknesses were. Yes, I need to improve my aiming. Yes I need to match my arrows better to the bow(s). But now I have a bow that in some unspoken way reveals that to me. It will still be a while before I understand this and start to find the right combinations of bow & arrow at the different distances. But that journey has now started. Thank you Adrian, Curt and Paul. I have been getting in training for a 5k run. No big deal? Well, it is for me. OK, I can occasionally cycle all night, but I am not the generally known for running around, except for a bit of wild Morris Dancing in the past, but even then it was generally in short bursts and rewarded with a pint or two at the end. Because it raises money to provide better healthcare for Africans; because I challenged Catherine to do the pointless overnight cycle ride and she trained hard for that, and she had done a 5k before; and partly as a challenge to myself to acknowledge and repay that effort. Anyway, it is happening in two weeks time on the 11th September and we are in training. Following a Nike training plan (from nothing to 5k in 6 weeks) we are now getting to the crunch time. I started tracking the training sessions recently if you want to see how pathetic I am. If you want to make me train harder, show support, or just throw some loose change at me then you can do that here. I try and keep my fundraising to one event a year and this is it. Stay tuned for the big day, I hope to run/jog the entire 5k without walking. This is going to be a ‘step-up’ for me! I was starting to get those nervous thoughts about this ride a few days before the event. Having completed the ride in 2005/(6) I know I could do the distance, I had a better bike (Trek 7.6), I had more miles in a better saddle (Brooks, of course), and I felt generally fit for it. But, I also remembered the aches, tingles and the exhaustion that came after the first ride and this time I had a partner, Catherine, who was doing it for the first time. I casually threw out a challenge some months ago, and now I felt a certain responsibility for her pre-ride anxiety. But, hey, it’s the DunRun! After spending the Saturday checking the bikes; and packing/stuffing two large panniers for every eventuality (both on my bike! ); we set off to Richmond for the Overground to Hackney Central with bellies full of pasta. There we faced the first obstacle, the line was not running as a previous train had stalled and would not be cleared for at least 30-60mins. Plan ‘B’ had to be train to Waterloo and then ride up through the city to London Fields. OK… here we go! Five minutes out of Waterloo station one of the panniers jumped off the rack and stuffed itself between the rack and the back wheel bringing me to a skidding stop. Yikes, it looked a mess. The rack had snapped a joint at the top and was bent. The back wheel still spun true and the bag refitted (just) and we pushed on through London. We arrived at London Fields. Hundreds, maybe over a thousand, cyclists already there relaxing, drinking and meeting friends. We pulled up near the pub and I managed to obtain a zip-tie from a stranger to pull the rack together again. I see Dave from the office and have a quick chat. And then we were ready! Final trips to the toilet (the gents queue far exceeded the ladies for once). A quick chat with James Bowthorpe; who we both saw arrive from his record beating round-the-world trip last year; before we left set the scene for long distance riding! The first part is a long crawl out of London into Essex. At this time (8.30-9pm) the local atmosphere is one of locals & pubs preparing for a serious session. At the end of the first series of climbs we pulled into a petrol station that was already mobbed by cyclists for an extra energy bar and soft drink. Only 10 or so miles in and already ready for a break. But we soon recovered and pushed on. The day was fading by now and lights were called for as the road lighting became intermittent. Soon we were passing through smaller and smaller towns, then hamlets , then villages, then out into countryside darkness. The stream of red tail lights ahead thinned out as the ride stretched out. Every now and then you met groups of cyclists stopped by neon-lit roundabouts refueling and waiting for friends. Sometimes we stopped too. It soon became a tortoise and the hare affair as one group sped past only to be overtaken later as they waited on the roadside to regroup. Trying not to think about the distance we passed 30, then 40 miles and started to think about the only official refueling stop at Sible Hedingham. After what seemed like an age we reached it at 1am and 50 miles in. The village hall was already crammed with a pelaton’s worth of bikes and riders. We got there in time to buy a torpedo roll to share and teas; then an empty of our bladders and a quick massage of shoulders, and we were off again at 2am. All along the ride there was a spectral appearance of a few people gathered around an unturned bike with a puncture (or worse) being attended to (typically comprising a light holder, a ‘doer’ and an advisor :-); a sobering reminder that we were only a flint away from that ourselves… but thankfully we never had such an adventure. Soon after we noticed a solitary rider slipstreaming in our, by now, lonely group of two, so we chatted amiably and, as it was Paulo’s first time, we teamed up for the rest of the ride. Daybreak crept in at the the 70-80 mile mark, as did more hills… did I mention the hills? For every descent we seemed to climb a longer ascent. By now (4am) we were devouring energy bars (Lucozade Sports) and drinks at regular intervals. Eventually the lights were turned off and we stopped at a lakeside carpark & toilet for a quick breather. The only litter bin in the toilet was over stuffed with bananas, food wrappers and energy drink cans – it only happens on one night of the year I suspect! Back on the bikes for the last push – it was mostly uphill of course! It might be only 30 miles or so, but it seemed to take an age. Eventually we see the first Dunwich signpost (7 miles to go) and our spirits rise – definitely worth a photo stop. The last few miles are cruel but with strangely different landscapes to see. And then the beach looms up and we are there just after 8.30am! We chain up the bikes onto each others and gather our belonging. The exhilarating sense of completion and dull aches compete with each other as we stumble about wondering what to do next. It has been about 12 hours since leaving with about ten of them in the saddle. I see Dave from the office is already cosy in his group – they offer breakfast, but the call of the cool North Sea wins out. We quickly strip to the base layers and work our way in over the shingle beach… it is cool but refreshing once up to our knees we feel the aches receding… waist high and the swell is pulling us around, a few quick plunges and we feel satisfied and head for the toilets for a wet-wipe and clean clothes (carried all the way in my bags, did I mention that?). Then for food… Dave’s offer was tempting but we were now three, and Paulo insisted on buying us full Vegetarian breakfasts from the beach cafe. Amazing efficiency from the staff saw them arrive after about 7 minutes, this must be their busiest day of the year and they are ready for it! Honestly, the rest is a blur of truck loading (hello Duncan!) and coach sleepiness until we got back to Spitalfields Market and remounted to get home via Waterloo station again. This time I felt a lot better after the ride than the first time, maybe it was the sea dip, maybe the leg massage when we got back, or just fitter? Now then, what about next year… !? What kind of ‘eggs’ do you cook? Inspired by another ‘spot-on’ analysis from Seth Godin. Personally, I always feel cheated by cheap eggs too. Gently crack a good quality egg (organic, free-range, etc.) into barely simmering water, into which you have added a teaspoon of vinegar. Get Wholemeal/Multigrain toast ready as the base. Butter it lightly then add a good smear of Marmite/Vegimite (a yeast-based salty spread) to the toast. Lift the egg onto the top of the toast when done your liking (I like mine still runny). Add a little pepper as required. Drink quality tea with it. – but sometimes I get into trouble with it. Last night was a good example. Took it into town after work for a meeting / talk. Had a good time. Tube back to Richmond about 10.30 then cycled back down the riverside to Kingston, The front light was failing… going down a path, something happened and the next thing I know I was flat on my back gasping for air. Luckily I landed on soil – but it felt hard. Dusted myself off and then cycled another 2-3 miles home. Felt quite shaken as I went to bed… and woke with back spasms barely able to move. Little wheels and a high position isn’t the most stable combination. Doctor says rest and painkillers is all I need. Gimme that co-codamol I say! Nova Swing: John M Harrison.